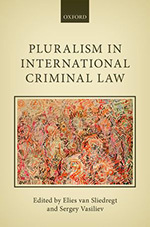 Pluralism in International Criminal Law (forthcoming) (Elies van Sliedregt and Sergey Vasiliev eds., OUP 2014). 28 pages. In this article, I argue for a universal concept of participation that would apply whenever an international crime is charged, regardless of the jurisdiction hearing the case. I argue that there are important reasons why a single universal standard should develop in international criminal justice, instead of simply deferring to whatever doctrine comes with the jurisdiction hearing the case. In 2014, the Appeals Chamber of the International Criminal Court cited the article in its inaugural judgement.